The instruments were designed with interchangeable signal conditioners, stacking option boards, and numerous display configurations. 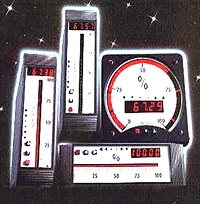 The client had manufactured an older line of analog meters. The circuit boards for the new product were designed to fit into their existing enclosures, minimizing retooling costs. This is a design example of an industrial bargraph with interchangeable input signal conditioners and multiple limits. A family of industrial bargraphs was developed for the client. LED displays were used to indicate the measured value in the desired engineering units as well as on a 101 segment bargraph. A tri-color LED bargraph, faster A/D, and opto-coupled analog retransmit are recent design improvements. The circuit design was implemented to fit existing circular and rectangular enclosures. The microcontroller includes non-volatile memory. RS-232 and RS-485 interfaces were designed into the instrument. Four alarm relays can be setup by the user through the front panel push buttons. Many signal conditioners were developed for this family of instruments.